In default installation Squid does not allow HTTP or HTTPS connections to non standard ports (defaults for HTTP is port 80 and for HTTPS port 443). If you try to connect to URLs like http://www.example.com:8080 or https://www.exampe.com:8443 your browser will show the Access Denied Squid page. 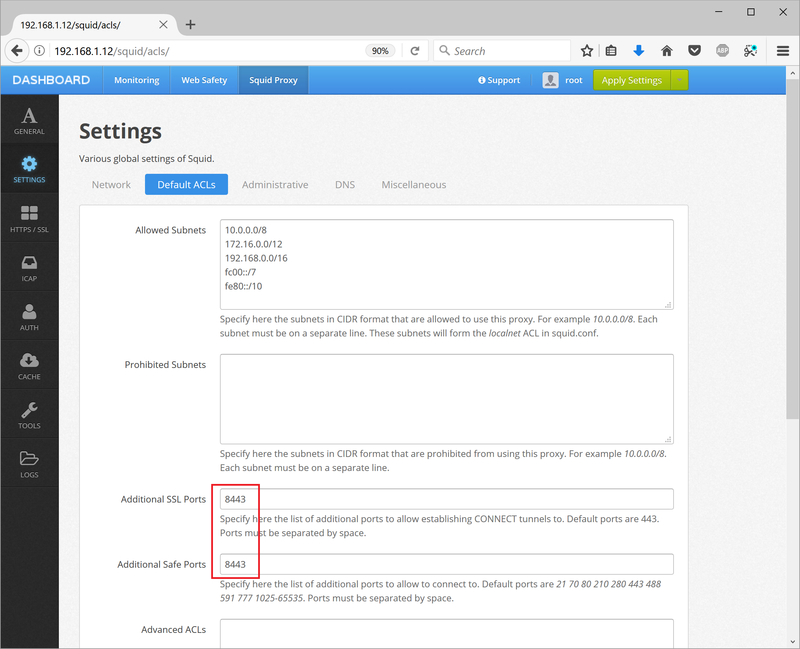 In order to allow connections to non standard ports add the required port number to UI / Squid Proxy / Settings / Default ACLs tab, fields Additional SSL Ports and Additional Safe Ports (both) as indicated on the following screenshot. If you have multiple ports, separate them by space. Click Save Changes and then Save and Restart in the top right corner. UI will generate something like the following lines in Squid configuration file. Connections to non standard ports shall now be allowed.